We were driving home from dance class the other day when my 7 year old daughter dropped this bombshell on me. Inner me: WHAT?! No! Absolutely not! You are in first grade. No boyfriends… EVER! Inner me: Thank You Lord! Thank you, thank you, thank you! I have to tell you that during this short conversation I felt like I should smile, cry, stop the car, laugh, & call my husband all at the same time. I mean REALLY? She’s 7. Jimmy and I haven’t really sat down and planned out our specific rules about boyfriends and dating yet. (Did I mention she’s only 7…) We’ve been more concerned with spelling lists & making sure we remember to get snacks for the class on our assigned snack day. Boyfriends? Rings? Ha! That seemed laughable. Until now. The more I’ve thought about it over the past week the more I’ve realized how unprepared I was for that conversation. I know that as parents we agree that there will be no boyfriends until our girls are older, but what age? What about dates? Group dates? Movie dates? After some discussion Jimmy and I have decided to wait to set specific rules. We are just going to continue having clear, biblically intentional conversations about boyfriends & dating and we’ll take each event as they come. In the mean time I’ll be reading, praying & asking God to prepare me for what lies ahead. I just never thought I’d be dealing with boyfriends and rings in first grade. Wow! I guess God’s just trying to keep me on my toes! 10 minutes later I found myself thinking about that ring. It’s been a while since I’ve posted, but there’s been a lot going on over here! Last Friday my post “Let’s Be Friends” was a weekly featured blog post on the Grace & Truth Linkup! I woke up Friday morning with a notification on my phone… Let me tell you, that was the BEST way to wake up on Friday! The beginning of last week I found myself having lots of doubts. I was doubting whether I should continue with this blog & with the book I’ve been working on. I was feeling a little discouraged & tired. Working full time, trying to take care of our home, my kids, & my husband, let a lone going to & serving at church… I was beginning to question whether God wanted me to do it all. That’s where I was last week. I didn’t feel like writing any more. I was doubtful that what I was doing was any good for anyone. I wondered if I was being selfish by even having a blog. Was I doing it to further myself in some way? So I told God that I was going to hold off until I heard from Him what I was supposed to do. I was to afraid that by continuing to write or pursue this blog I could do a disservice to His word. Then Friday came. First, I woke up to the notification on my phone about my featured post on Grace & Truth. I was so excited! I reached over, hit my husband (a little too hard… lol! ), and told him that I’d been featured. I was in a slight state of shock throughout the morning. I wanted to dance around my office! God had CLEARLY shown me that I wasn’t doing His word a disservice. In fact over this past weekend God has kept encouraging me through my friends, family, and even online followers. So I want to take a minute not only to thank The Lord for reaffirming me this weekend, but also to all of you for reading, sharing, commenting, & encouraging me. I treasure every visitor that comes across this page. As a thank you, I’ve made some encouragement downloads for you! Feel free to print or save them & use for your own personal use. Click the link underneath each picture to download each image. Today I’ve Linked Up with Titus 2 Tuesdays over at Cornerstone Confessions & #RaRaLinkup over at Purposeful Faith! I’m joining up with the #FMFPARTY Five Minute Friday group again this week! If you haven’t heard of Five Minute Friday go check out Kate Motaung’s page about it over at katemotaung.com/five-minute-friday. Blogging for Five Minutes on Friday about a specified “Prompt Topic” I have to say that only typing about a topic for 5 minutes is a HUGE stretch for me, but I’m really enjoying it. If you’ve ever heard the phrase, “The best laid plans of mice & men often go awry.” You know the basis of my life. I am a planner. I love lists & preparing for upcoming events. I used to be a wedding planner (that’s another post entirely in and of itself!) & I loved the entire planning process from beginning to end. The thing is, my plans for my life & the lives of my family DO often go awry. I’m not a foolish person. I don’t just jump at every opportunity that comes up. I’m a detailed planner. When I graduated High School I “planned” to get a business degree then own my own bakery, definitely NOT what ended up happening. So why do some of my “plans” come up short? They don’t work out when they are MY plans & not God’s. When I get an idea or start to make a plan of action I need to step back and really evaluate WHOSE plan it is. Am I coming up with this all on my own or have I truly been guided by The Lord? This blog is a great example of that. I felt God calling me to write. Now, he originally called me to write a book (and I am), but when I got stuck in the process and was about to give up on it He pointed me toward blogging. I questioned & doubted whether it was me or God that came up with that, but after lots of prayer & searching for His answer, He has begun to open my eyes to His plan for it all. Well, my five minutes are up! This five minute thing is CRAZY! I could probably go on forever… Hmmm… I think I’m already coming up with my next post! I’ve been inspired! How have the “plans” you’ve made on your own changed? I would love to hear how God has moved in your life! I’ve never been good at friendships. I’m not saying that I’m not a good friend. I’m kind, I try to listen, when I’m out with friends I have fun. I’m just not good at starting or continuing a friendship. Sometimes I don’t neglect to contact a friend and say “Hey! Let’s get together!”. It’s not that I don’t want to do it, there’s just something that stops me. So what hinders me? I worry about what others will think about me. A real friendship means that you have to open yourself up. “Surface” friendships, where you don’t get very deep and can just exchange pleasantries, are easy. Deep, meaningful friendships happen when you open yourself up to one another. You have to let that person in. That scares me. I worry about people judging me. I worry that they will find out things about me that will turn them off. I worry that they will find out that my entire bedroom floor is currently covered with clothes. I worry that they will find out that sometimes I am rude. Sometimes when others are talking I’m not listening very well because I am distracted. I worry that people will find out these things and will no longer think highly of me. I would say my best friend is definitely my husband. Obviously, it is a good thing for him to be a best friend. Other than Jesus Christ, my relationship with my husband should be the next closest relationship that I have on this earth. It’s good for our marriage and good for our family. My husband sees me in my best and worst moments and still loves me in spite of it all. I think that is one of the reasons that he is my best friend. If I snap at him in a moment of frustration or bawl my head off because I’ve had a hard day, I know he’ll still be there and love me just the same. Will a friend do that? That’s the heart of my personal struggle. Lately God has been speaking to me about my problem with connecting with people. I have a lot of surface friendships but I am very weary of opening myself up to something deeper. To me, this is one of the reasons we are not supposed to live life alone. We CAN do things alone, but that doesn’t mean that is the best way to do it. I mean, having two arms DOES make most tasks more manageable. There are so many things in life that we can’t physically do alone. When I read the first part of Ecclesiastes 4:10, it says that if either fall down the other can help him up. How many times do we “fall down” in our Christian walk? Every day! Every day I make mistakes, I sin. WE are sinners, and so we are going to “fall down” at some point. Having a friend, doesn’t just keep us accountable, but it also reminds us that we are not alone when we do fall. A close friend can be there to help support you in Christian Fellowship. Why should we pity them? Because, unfortunately, they have chosen to not surround themselves with people who would help. This is where I am. God has been working on me that I need to be in closer fellowship with other women. As women, we need to be better about creating & working on close friendships. So what does that mean? Am i going to pick up the phone tomorrow and suddenly have a new best friend? No, but there are some things that God has placed upon my heart to focus on. God wants me to work on making some of my “surface” friendships, true friendships. First, God is calling me to step out in faith. Yes, I am scared to open myself up to others, but my fear is not an excuse to disobey what God has called me to do. My emotions cannot determine whether or not I follow through. I have to trust that He is guiding me toward women who will care about me in spite of my faults. Now, just because I step out in faith & obey what God has asked me to do does not mean that He has promised it will be smooth sailing. Relationships require people. People have baggage. Baggage causes problems. Even though there may be some bumps, I need to continue following God in the direction that He wants me to go. Secondly, God has opened my eyes to the receiving end of friendship. Friendships require us to open up and share our struggles with one another, but when a friend is opening up and sharing we must remember to listen without judgment. One of the reasons that I struggle with connecting is because I worry about what others are going to think of me. What do we see on tv and social media? Cat fights & gossip. We see women tearing each other down & being applauded for their actions. Why are many of us weary of opening ourselves up to other women? This is why. If we want close relationships we have to take it upon ourselves to stop silently (or for some, publicly) judging each other. Opening ourselves up is only the first step. We then have to listen & support each other without judgment or condemnation. I am going to be working on developing closer Christian friendships, and I challenge you to do the same. I actually have someone that God has brought into my life hat I am going to call this week to get together and have lunch. I’m nervous, but excited to see what God has for this new friendship. If you don’t have any issues with developing genuine, close Christian friendships with other women, look around you. Is there somewhat in your social circle that doesn’t seem to make connections easily? Ask God to show you someone that He wants you to connect & fellowship with. I would love to hear what God is saying to you. Please let me know in the comments or follow me on facebook or twitter and let me know! So this is my first time joining up with the #fmfparty group! YAY! I’m excited! FMF means “Five Minute Friday”. On Fridays many bloggers take the opportunity to write for five minutes on 1 specified topic. I first heard about it a few weeks ago and this week I’ve decided to join up! Check out Kate Motaung’s over at her blog “Heading Home” for more info about the #fmfparty. So I was thinking about why we gather. This weekend I am gathering with several Children & Youth Church Workers to learn how to create better ministries. Sunday I will gather with other believers in Jesus Christ to worship God & learn more about Him. Next week my family will gather to celebrate my daughter’s 7th birthday! We gather together in times of joy & in times of deep sorrow. Sometimes we just gather together so we can talk or have a good time. We NEED to gather together. I know as a wife & a mom it really helps me when I can get together with other women to share & talk about what’s going on in our lives. I have a friend that I don’t get to have lots of quality conversation time with because we’re both so busy. Let me tell you though, when we DO get together & talk we can talk for hours! I always come away from our conversation feeling so much better because I know I’m not the only one that struggles with balancing all of the areas of my life. So in God’s word He’s even telling us to gather! We need friend & family time. We need to share with & encourage one another. I think that’s one of the reasons why the #FMFparty each week is such a great opportunity! We can virtually “gather” together to talk on one topic. We can share & encourage. Ok, my five minutes are up. Thanks so much for “gathering” with me this week! I’m also linking up with www.christianmommyblogger.com today! If you’re a mom that blogs check it out! I would love to hear from you! Let me know in the comments below what you do to get in some good Friend or Family time. I would love some new ideas to use myself! So I’ve been stuck at home the past couple of days due to the snow storm that came through Friday Night & all day Saturday. Crazy! I was SO NOT expecting that! Since the weather has snow bounded me… You get something FREE! That’s right! I created an 8×10 printable from a verse I used in my latest post on Ruth and I’m making it available for you! I love Psalm 9:9! Feel free to Pin, Save, Share, & Print! It’s created to fit in an 8×10 frame so enjoy! 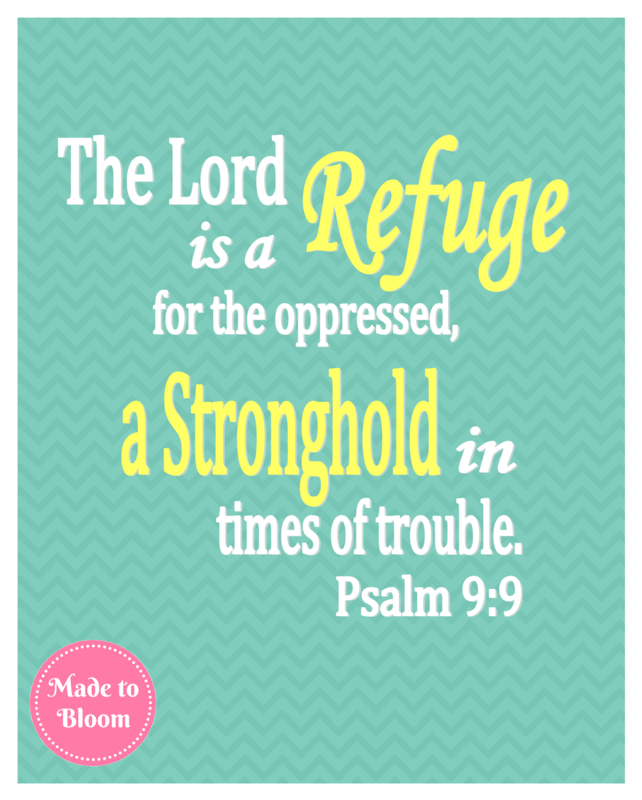 Do you have a favorite verse that you would like to see as a free printable on Made To Bloom? Comment below & let me know! I love this kind of stuff! So it’s been a rough few days. Nothing bad has happened. No one in our family is sick. *THANK YOU LORD! I SO APPRECIATE THAT! * I have just felt overwhelmed & frustrated. There’s a lot going on right now. Church events, School events, birthdays, baby showers, etc… My mind just feels like it’s swimming with everything that is coming up. I feel like I can’t get ahead of everything and because of that I feel extremely frustrated. Now, before I continue I have to say that what he said to me COMPLETELY explains the main reason I knew I was supposed to marry him. Forget my puppy love for him, his blonde hair, his blue eyes, the fact that he’s a great cook… THIS is why I married him. AMEN HALLELUJAH PRAISE THE LORD! You see, my husband isn’t a “Good Man”, he’s a “Godly Man”. As a husband he is the spiritual leader of our home. He looks out for our physical & spiritual well being. He cares about my relationship with Jesus Christ and takes an active role in my spiritual growth. We sat together last night and prayed. We asked God for peace, guidance, & strength. We thanked Him for the blessings He has given us & for the plans he has for us that we don’t even know about yet. As my husband prayed over me I cried and felt The Lord remind me that He has given me a partner to share my burdens with. The problem is when I was a teenager “Godly Man” was not at the top of my priority list when it came to “Qualities of my Future Husband”. By 17 I had an ongoing mental list of qualities that were important to me in a future husband. That’s right… I put SHOULD be a Christian. I can honestly say that whether my husband knew Jesus Christ as his Savior & Lord really seemed more like an added bonus than a necessity. Looking back it really should have been my main priority. I could have saved myself a lot of heartache if it had been important to me when I started dating. I’ve had some girls ask me how to know who to date or marry. I like to share this bit of advice that I got after I was already dating my husband. I wish I had gotten it sooner. A person does not know what REAL love is unless he or she has accepted Jesus Christ as their Lord & Savior. The love of Christ is what REAL love is. The love of Christ is forgiving, full of grace, full of mercy, and never ending. He gave everything, he gave his life for us. If you don’t know Him, then you don’t know what love should look like. A “Godly Man” will not only love you and treat you the way that Jesus would treat you, but he will also invest in your relationship with Christ. If he is truly a follower of Jesus Christ, he will want to find a wife who has a relationship with Christ. 2 Corinthians 6:14 calls us to not be “yoked together with unbelievers”. In order to be the spiritual head of your household he has to lead & help you grow. I am so thankful that God put my husband and I on the same college campus. I am thankful that He arranged for us to be introduced to each other. I am thankful that my in-laws raised him in a Godly Christian Home. I can’t imagine what our marriage would be like without OUR faith & OUR trust in The Lord. What do you think? Do you have an example of a Godly man in your life that you would like to share? Please feel free to leave a comment below, I would love you hear from you! This post has been shared on the Grace & Truth Linkup! Rest… Ain’t Nobody Got Time For That! …But I Should! So I’m sitting in a condo, out of town, away from home, away from work, away from kids, away from distractions. It’s CRAZY quiet because my husband and our friends that we came here with are at their conference. I am alone with coffee and quiet. I know that God has provided this time for me to rest. I NEVER get time like this. SERIOUSLY! This is a GIFT! So why am I so restless? Why can’t I sit here and soak this up? Why do I feel like I need to get up and do something? I am realizing that I DON’T KNOW HOW TO REST! Do you rest? Do you ever take time to not do anything and just sit and reflect upon the things that God has done and is doing in your life? We are called to rest. God talks about rest OFTEN in His Word. I mean… even God stopped and took the time to rest and He was the all powerful, almighty creator of EVERYTHING! After God created the Heavens & the Earth he took a day to rest. GOD TOOK A WHOLE DAY TO REST… I have problems taking 30 minutes to rest! I look around me and we all are GO, GO, GO! No one stops. Even those of us that are Christians and know that God called for us to take times to rest! We fill our hours with activities that are, when you look at them, “Good” activities. We work hard at work/school. We help our families, friends, & neighbors. We serve in church with different ministries. We volunteer with community organizations. These are all inherently “Good” things, but even “Good” things can be used to fill up our time and distract us from the things that God wants of us and for us. I personally have an issue with finishing a project or event and then jumping right in and looking at what’s next. Scripture tells us in Genesis 2 that God finished what he was working on and then STOPPED. Not permanently, but for a day. He rested. When we have finished a project, event, game, season, even a day or week. We should take some time to rest and reflect. We should thank God for the things he has done. Thank Him for what he is doing at that moment. Ask Him what he wants us to do differently in the future. Then we should rest & listen. We can’t expect to hear an answer from The Lord if we don’t take the time to stop, quiet our minds, and listen. I am really writing this as a lecture to myself. My ADD mind is making a list of things that I should do right now. 1. Write another blog after this one. 2. Study for my Sunday School Class. 3. Work on writing a chapter of my book. 4. Do my nails because they look gross. 5. Pull out my agenda calendar and fill out the February month of events. But I’m not going to. It’s going to be hard, but I’m going to sit here, drink my coffee, read a devotional or two, and rest. Do you think I should set a timer? Do you set aside time to rest? What does rest look like to you? Leave a comment below and tell me about it. When I think of an addict, I get a picture in my head of a person sitting on the floor in the fetal position. She’s rocking back & forth with a wile look in her eye. She is jumpy and her eye makeup is running because she has been wiping away the tears. She needs something desperately, and feels like she can’t live without it. Is this you when you can’t find your cell phone? You may have chuckled a little to yourself just now, but unfortunately I’m not joking. Our Youth Group goes to this amazing church camp for a week each summer. It is the most fun, energy filled, youth centered, & Jesus focused week. Seriously, the week after camp we all tend to get homesick… for camp! That’s how much we love it there. The camp doesn’t have a lot of rules, but one of the BIGGIES is… no cell phones. No Joke, if a camp counselor sees a Youth with their phone in the middle of camp they will take it away & it will be mailed back home at the Youth’s expense. I agree with the rule. Too often we are too caught up in what is going on in the world and we can’t focus on what God is trying to tell us. So when we go over camp rules a few weeks before we leave each year it always amazes/scares me to see the reactions from some of the Youth (mainly girls) who have not been to camp before. They Freak Out. I mean REALLY freak out. One year, a few days before camp, a girl told me she was already having anxiety attacks just THINKING about being away from her cell phone for a week. So… Are you addicted to your cell phone? 2. Do get a panicked feeling when you reach in your pocket/purse & can’t find your phone? 3. Do you put off schoolwork, sleep, or other responsibilities to be on the phone? 4. Do you feel depressed when you haven’t been on your phone? Maybe you need to take a serious look at your NEED for your phone. A phone can be very important. When in an emergency it can honestly be a lifesaver, but be careful of how much you depend on your phone. Is it what makes you happy? Is your social media & texting how you feel appreciated & loved. Do you spend more time on your phone that with actual people… talking… not on the phone? Are you spending more time on your phone than reading your bible? Praying? Spending time with God? Has your phone become your addiction? If so, take it to God. Confess that you have put it before him & other things. Ask him for help with this temptation. Maybe you need to talk to your parents about setting up some specific rules about cell phone use. No Joke! I found out while researching this that there are actually apps that are supposed to help you with your cell phone addiction. It might not be a drug, but a digital based addiction can still keep you away from your real life. BreakFree is the best Android app for monitoring and taking control of your smartphone usage habits and your digital life. It helps you check your addiction levels and also helps you unplug and disconnect from your smartphone. With BreakFree you can focus on what’s important. Disclaimer: I am in NO WAY endorsing either of these apps. I do NOT own either of them nor am I being paid to mention them. I ONLY give them as an option that teens should discuss with their parents as a possibility. Take a step back. Put the phone down. Go find something to do without it. Maybe even have a REAL conversation with someone. I would love to hear from you! Do you struggle with this? Do your teens struggle with it? Leave a comment below. Have you ever felt far away from God? First let me say that YES, I have felt like that. I have felt distant from God in good times and bad times. It creeps up on me. Everything seems to be going fine and then all of the sudden (or at least it FEELS all of the sudden) I feel like I’ve lost that close relationship with God and I can’t feel his presence. The feeling is awful! It’s lonely & empty. So I ask YOU again. Have you ever felt far away from God? If you honestly have never felt distant or far away from God then FANTASTIC! I’m so glad that you have never in your Christian walk felt this way. It is something that I wish none of us would ever experience because of how awful it feels. If you have felt that way know that you are not alone. (And I mean that in more ways than one!) There are many Christians who have walked through difficult valleys in their life and felt alone and out of the presence of God. The problem with saying “I don’t feel that God is with me” is the key word in that statement. FEEL. You may not FEEL God with you or around you, but that does not mean he isn’t there. He is ALWAYS there. When Jesus Christ, God’s Holy Son, died for our sins as the perfect sacrifice, God not only created a way for us to go to Heaven but he also sent the Holy Spirit to be a messenger or presence in us. The Holy Spirit reminds us of Jesus Christ’s teachings. 1. 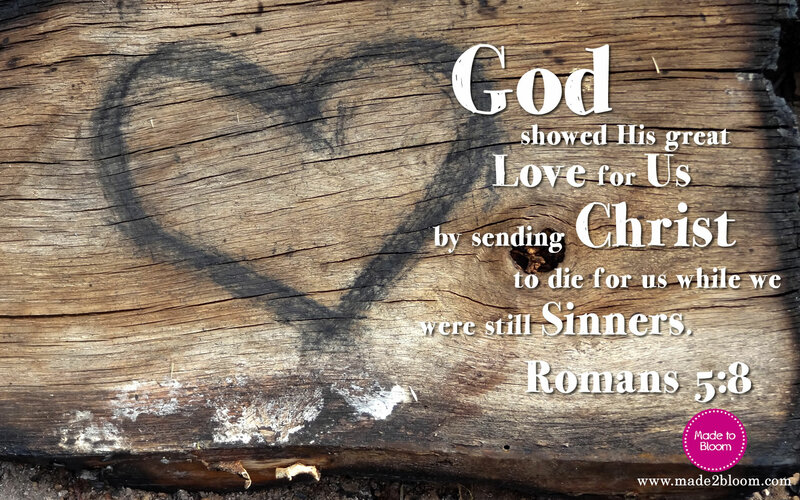 God created us, loves us, & sent His one and only Son to die for our sins. 2. Jesus Christ died for our sins & if we accept that he is The Son of God, confess we are sinners, ask Christ to forgive us our sins, & to come into our hearts & lives we can have everlasting life through him. Jesus promised to guide us through his teachings, God’s Word. 3. The Holy Spirit was sent to be the presence of God & The Son that helps guide us. When we do FEEL God’s presence we are FEELING God through The Holy Spirit. Ok, so now you KNOW… but, sometimes that’s not enough. Sometimes just KNOWING you’re not alone doesn’t change the fact that you FEEL alone. So how did we get to feeling this way? How can we change it? I’m not talking about a good friend to your BFF, your classmates, or even your siblings. Are you being a good friend to Jesus? Think of how you would grade yourself. Are you talking to God? Do you need to ask forgiveness for something, but haven’t? It all comes back to our RELATIONSHIP with God. A healthy relationship comes from two individuals doing their part. 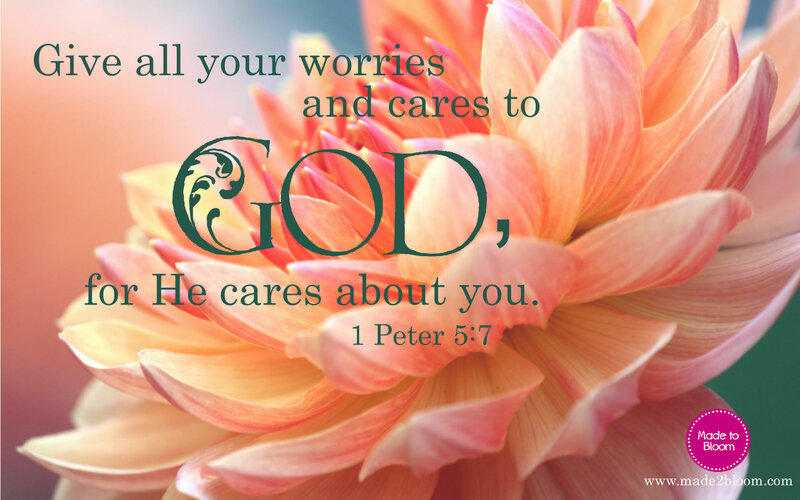 God loves you & promised to listen and take care of you. So are you doing your part? Sometimes when we FEEL distant from God it’s because we have been slowly slipping away and suddenly realized that there is an ocean between us. So jump in & start improving your relationship with him. Pray even though it’s hard, read even though you think it might be boring, go to church to worship The Lord & be in fellowship with other believers. Share with close friends & family members what you are feeling. Keep reminding yourself… I AM NOT ALONE! HE IS ALWAYS WITH ME! I would love to hear from you. Please feel free to leave a comment below. Hi! Welcome to "Made To Bloom" with me, Megan Adams. Subscribe to Made To Bloom to get updates & fun stuff in your inbox! Faithful Blogger Tribe Come Join Me at The Faithful Bloggers Forum Tribe!